Simeone gets the Partey started! Kevin Gameiro changed the game when he finally got on the pitch on Saturday afternoon, but the same can be said of Thomas Partey, who was given his first minutes since returning from an impressive African Nations Cup, in which he was a major factor in Ghana’s run to the semi-finals. Of course, the French striker’s hat-trick will grab the headlines – and rightly so – but Thomas’ impact on the match was equally important, even if it was subtler. “The final 15 minutes, with Thomas on the pitch, put an end to [Sporting Gijon’s] strength,” Diego Simeone said of the Ghanaian after the match, heaping praise on a player he has been talking up more and more in recent weeks. Ahead of the Copa del Rey semi-final return leg against Barcelona, for which Gabi was suspended, the Argentine coach was confident in the 23-year-old’s ability to deputise if necessary and seemed genuinely excited about the potential contributions of one of the African Nations Cup’s breakout stars – one who started every match of consequence and who even earned a man of the match award in Ghana’s win over Mali. Although the defensive midfielder never actually got on the Camp Nou pitch that night after an injury to Diego Godin forced Los Rojiblancos to use an earlier-than-intended substitution, the coach did back up his praise with action by giving the green light to the player’s contract extension – it was renewed to 2022 last Tuesday – and by turning to him when needing to see off Sporting on Saturday. As Simeone explained after the match, he wanted more control in the centre, even at the expense of attacking strength, so Thomas was introduced in the 68th minute and he contributed with a little bit of everything. Not only did he stop Sporting from so easily bursting through midfield, but he also tracked all the way back when necessary and, quite simply, injected some much-needed energy into Los Colchoneros’ play. When it came to his passing, he was also effective; even if only five of his 12 passes went forward, he was sensible when it came to maintaining possession and he completed 10 of them. His assist for Gameiro’s second summed up his contribution in microcosm, with the midfielder putting pressure on Fernando Amorebieta so high up the park that the defender wasn’t prepared and, when the ball dropped for the Frenchman, he was already close enough to goal to shoot just three touches later. That won’t be enough to earn Thomas a starting berth any time soon, but he did enough to prove that he can be useful, just as he was in the final months of last season. It’s worth remembering that he was sent on to close out all four legs of the Champions League quarter-final and semi-final wins over Barcelona and Bayern Munich and a similar impact from the bench would be most welcome in the final months of the 2016/17 campaign. 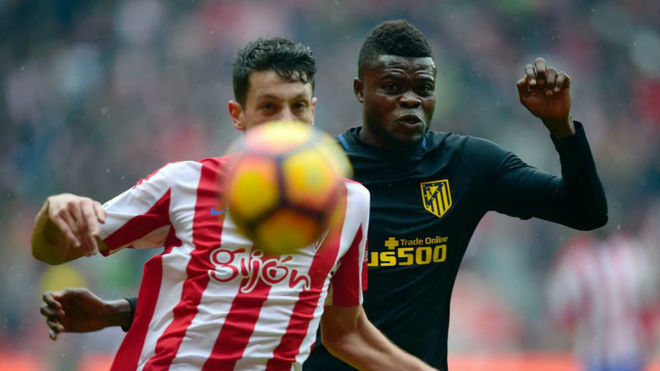 For the first time in 2017, Simeone trusted Thomas Partey with more than 10 minutes, getting him started for what could be an important few months.